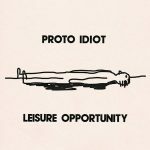 Proto Idiot is the kind of band I spend a lot of time hoping to find but never getting lucky enough to actually run across, so hearing their November 2017 release, Leisure Opportunity, was a rare delight. Their sound is a bright and delirious combination of garage punk, psychedelic rock, and addictive joy. The music off their feels both retro and timeless. You could hear Proto Idiot comfortably played alongside The Kinks, The Specials, or Arctic Monkeys. The Manchester band is very open about the stupid, playful nature of their music, describing themselves as “a dim-witted, ill-conceived garage-art band” before gleefully skipping off into a field to create some blissful pop. Their albums For Dummies and Andrew Anderson are well worth a listen, but I’m here to talk about Leisure Opportunity because it is a gem of a thing. There’s apparently some thematic stuff going on with the record, but you can safely ignore that (as well as the intentionally ridiculous description from the band that makes a comparison between Leisure Opportunity and Eddie Murphy’s Raw) in favor of just listening to the damn thing. The music mocks and adores the artists who inspired it. The sound is clearly celebratory, reveling in just how fun it is to write and play these songs, which makes it all the more impressive that founder and vocalist Andrew Anderson can make his guitar sound as sneery as his voice. It’s perhaps the first album I’ve happened across where you can hear the self deprecation in the actual composition of the songs rather than the lyrics. The vocals are strained and pouty, creating an impish sense of petulance; the instrumentation is beautifully sloppy — everything is kept in time and played well but has a feeling of being rushed and passionate. Tiny four and six note fills are scattered throughout the album and contrast the sometimes droning rhythm section and the occasional artfully tortured guitar solo (check out “Proto Paradox” for a good example). “Yes yes yes yes” is the test case for new listeners — if you like that song you’ll like the rest of the album, if you hate it Proto Idiot probably isn’t for you. I’m truly impressed with the novelty and joy the band was able to pull together using relatively simple tools — everyone is competent but there’s no arrogance or showy virtuosity. The band is your classic three-piece punk band strumming fast through nearly every track but the song structures are compelling and feel fresh. Leisure Opportunity is tremendously fun and well worth a listen, as is the rest of Proto Idiot’s discography. The band is currently with Slovenly Recordings, whose Facebook you can visit to see the video for “Do you know me now.” Check out the band’s Facebook to keep up with new releases and tour information. Reviews: Fires, Second Still (2017), Duran Duran (1979). it’s a good one, isn’t it. Well done Alli!